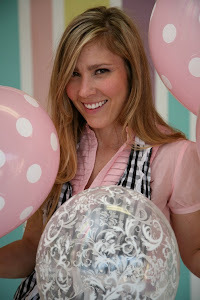 How cute are these mini's for a baby shower?!! The baby's name is ........ Daisy!! *unanimous "aaaaawe"* They are 3 dozen white and chocolate with buttercream filling and fondant daisy decor for a baby shower at Karmany Yoga in FW. The client requested not too much pink, per the mommy. Now this cake was definitely a little out of my comfort zone! For one- I don't get a lot of requests to do animals/3-d sculpted, and two- armadillos scare the ever loving buttercream out of me!! 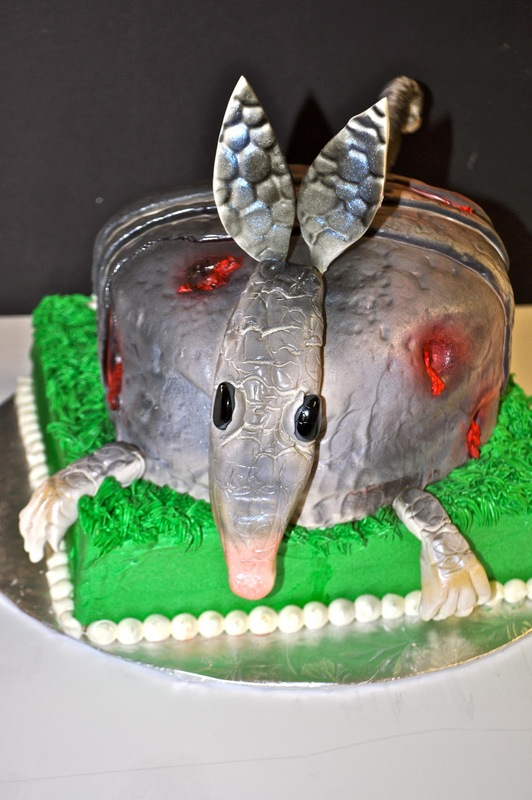 But this Birthday Cake was for my neighbor, who I now know goes by "The Diller Killer" and all he wanted for his birthday was an armadillo cake. His wife requested the bullet holes- so that will be a nice little surprise for him. This is an Aggies groom cake- it is a white cake with buttercream frosting and filling and some GIGGG EMMMM fondant details! This order was for 8 dozen Mardi Gras themed cupcakes for an open house at Retina Consultants of FW. They were chocolate and white cupcakes with buttercream frosting and lots of fun Mardi Gras fondant details- masks, beads, etc! 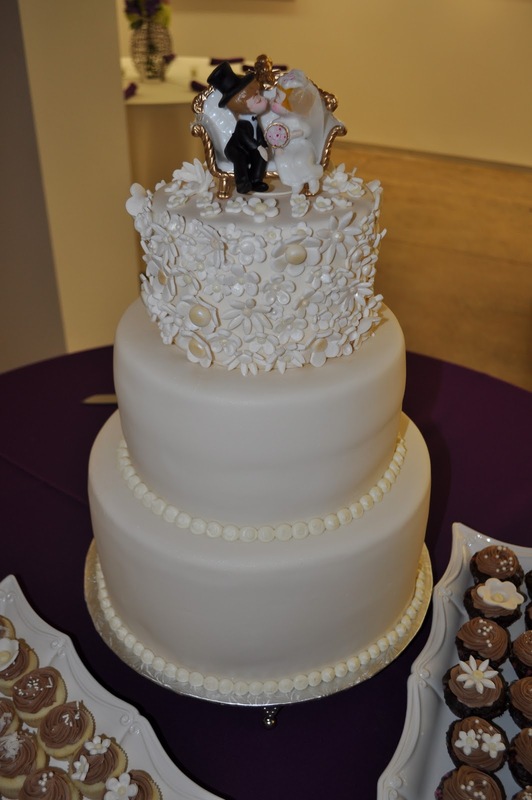 Last weekend I had the distinct pleasure of making this beautiful wedding cake for Drew and Dave. Drew and I discussed designs and looked at pictures of cakes she was drawn to, and she decided on this particular cake- which I love! It is a 12" 9" 6" cake- bottom tier Key Lime Blueberry cake with fresh blueberries and buttercream filling, top 2 tiers mocha chip with chocolate buttercream filling. 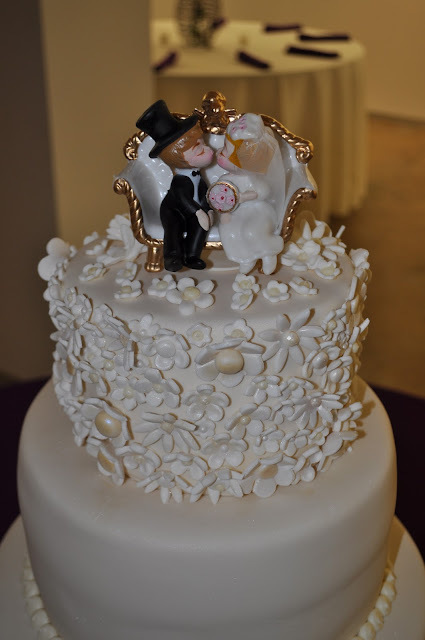 The cake is covered in ivory fondant, and top tier is covered in lots and lots of little fondant flowers. 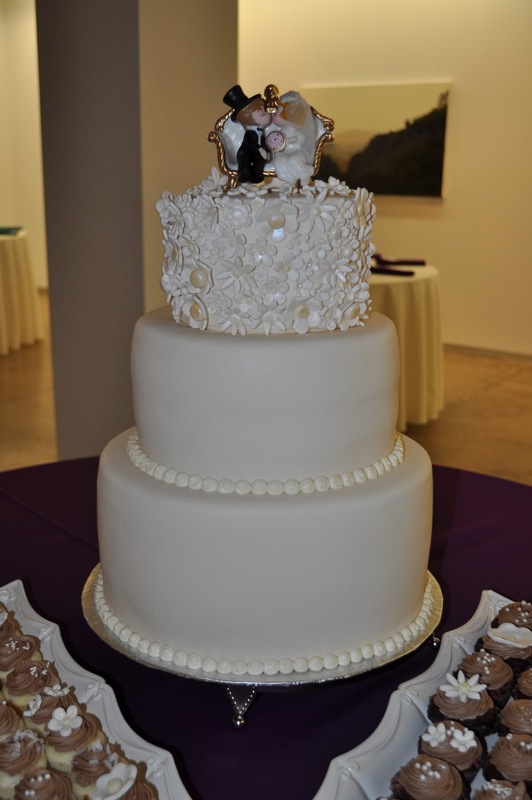 The flowers were all hand made and luster dusted with 4 different shades to go with the vintage feel of the cake! Drew and Dave also requested 8 dozen mini cupcakes- they are coconut with chocolate buttercream and chocolate confetti with chocolate buttercream. This smash cake combo is for Scarlett's first birthday! The whole theme of the party is red & white, with lots of polka dots! 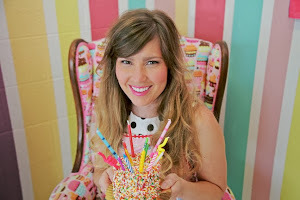 The smash cake is a confetti cake- with red sprinkles so that even the cake looks polka dotted!! The big red bow is made from fondant. 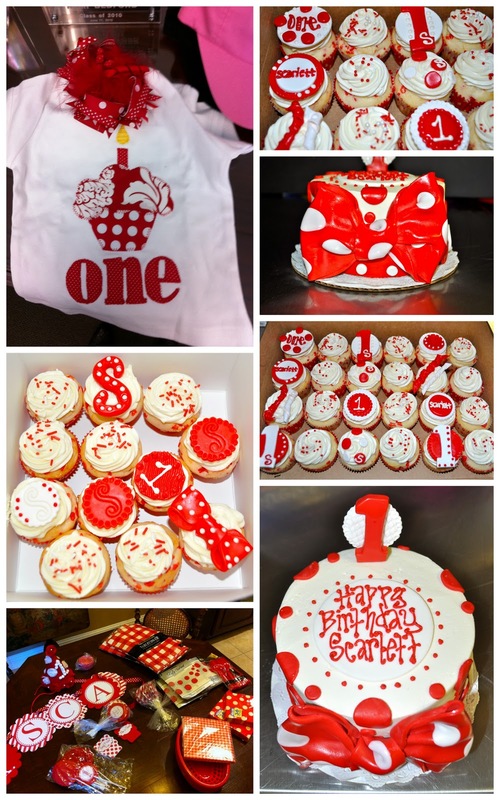 The cupcakes are 2 dozen standard and one dozen mini of the same red confetti cupcakes, with lots of cute matching fondant toppers! 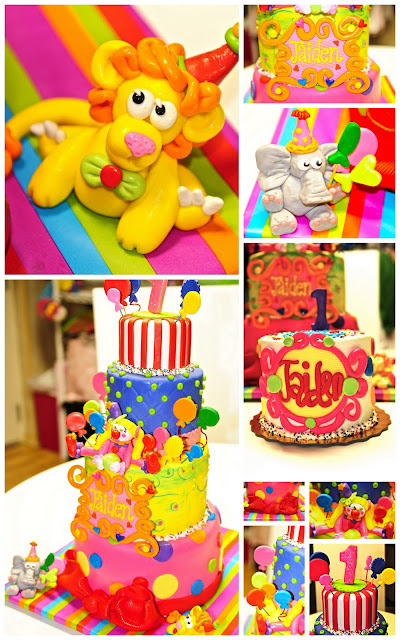 I really adore this art party cake!! 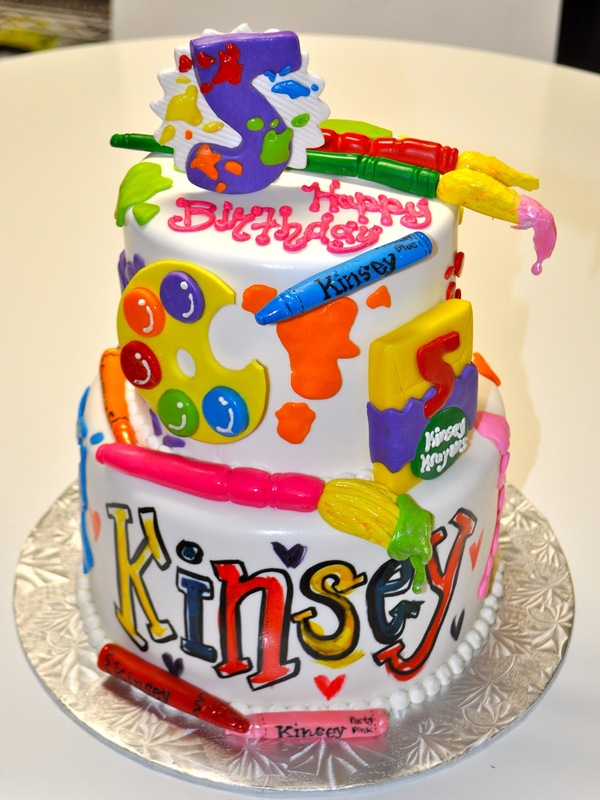 Kinsey's mom had contacted me about doing a cake for a 5th Birthday "Art" Party. 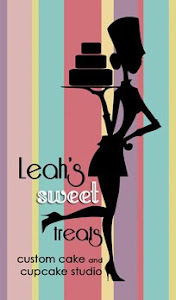 She already had sooo many precious goodies/treats/invites that she shared with me, I knew the cake had to live up to the rest of the party!! :) It is a 6" & 8" stacked - the top tier is all confetti (how cute will that be when they cut into it!?) and the bottom tier is "tuxedo" chocolate, confetti, chocolate with buttercream filling. The cake is covered in white fondant with lots of fun fondant details: paint brushes, paint palette, crayons, "Kinsey Crayons", and paint splatters! One of my new favorite cakes ever! 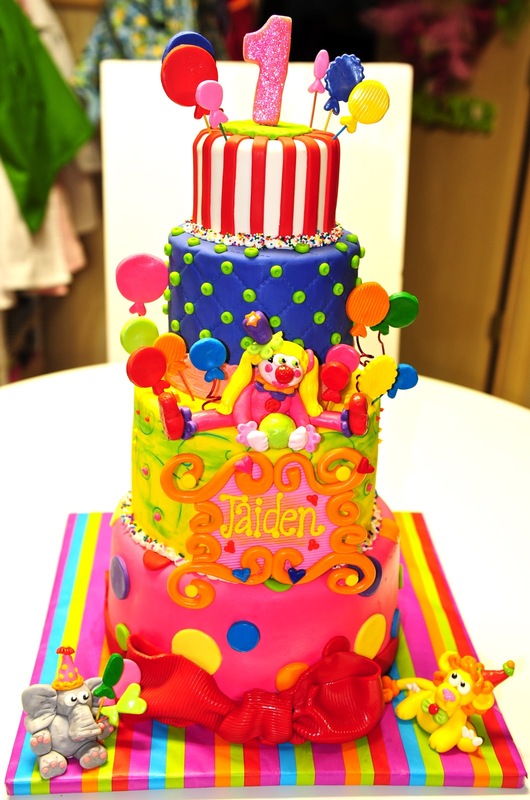 Taylor contacted me about doing a Circus Themed cake for her daughter Jaiden's first birthday and I was super excited! I sent her a bunch of "inspiration" pics and we went from there. She was totally open to letting me just go with it, and we decided to add in some girly colors to the otherwise typical primary color palette of a circus theme. I am thrilled with the outcome and think the cake is awesome! 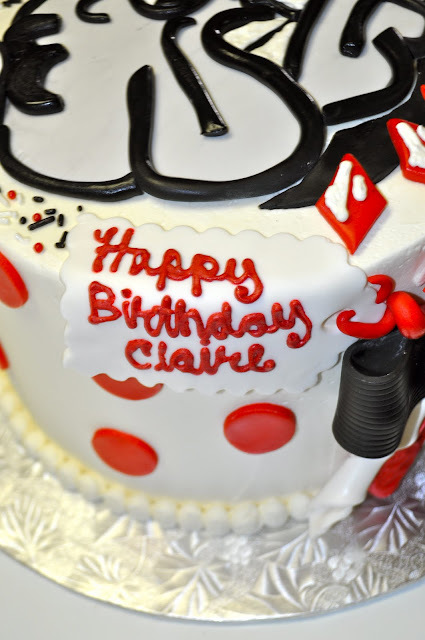 The big cake is a 10" white cake with buttercream filling, 8" chocolate chip cake with buttercream, 6" red velvet with buttercream, and 4" white with buttercream on top. The entire cake is covered in fondant with lots of fun fondant details! The smash cake is a 6" white cake, with a corresponding vintage-y circus name plate, fondant polka dots and a purple one on top. 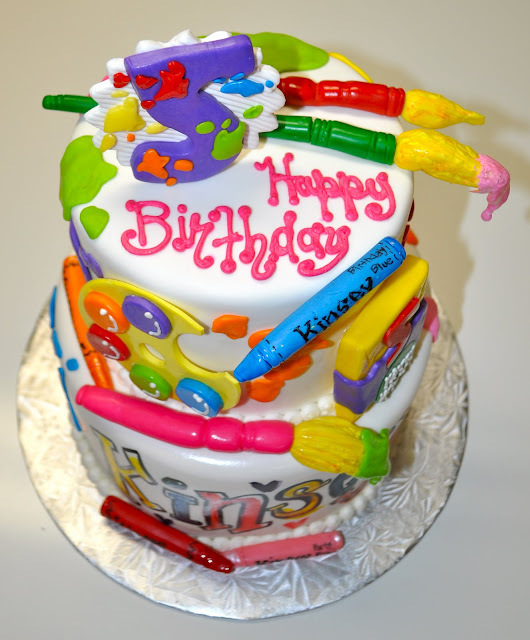 This 30th Birthday Cake is for Kristin's surprise birthday tonight at "Painting with a twist"! 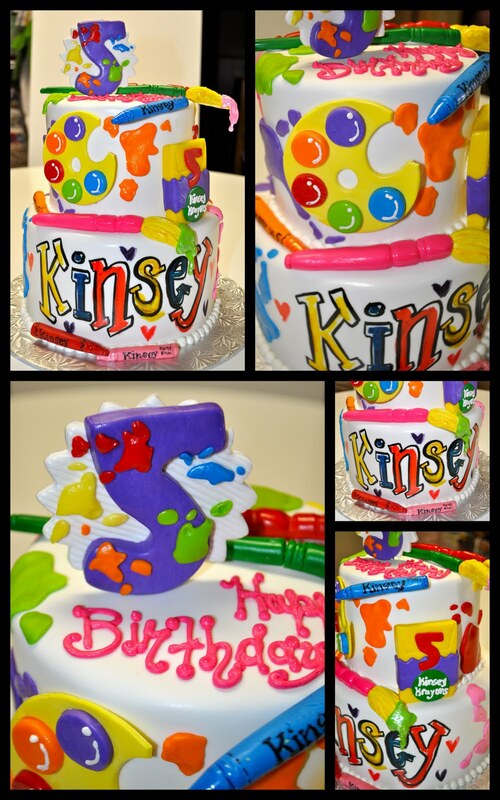 Her sweet sister Kim planned everything, and gave me a general direction to go with the cake- paisley and fun colors! 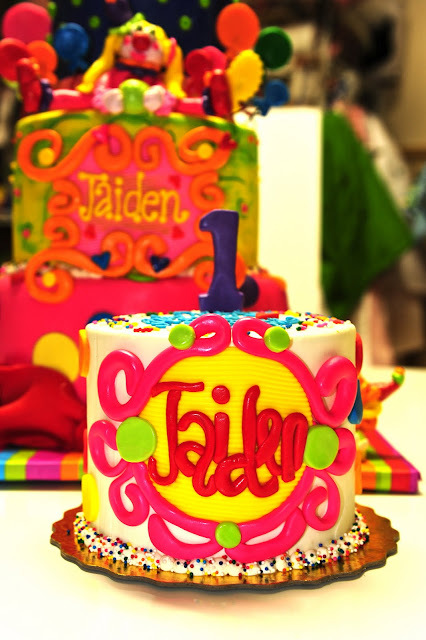 I really enjoyed working on this one because I don't always get to do a lot of buttercream piping, and you KNOW I love the bright colors :) It is an 8" white cake with cream cheese and fresh raspberry filling covered in a funky orange buttercream with buttercream paisley and floral details. 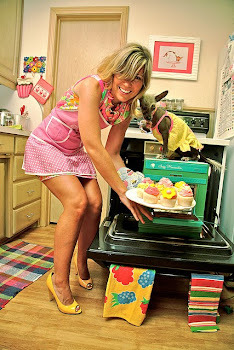 Please be sure to click on the picture to enlarge- whenever my photos are uploaded into blogger the automatic lower resolution of the picture distorts the colors a bit- so they are off just the slightest, but for a cake like this it makes a big difference! This 8" Red Velvet Cake was for a birthday celebration and the Georgia vs Boise State Game! 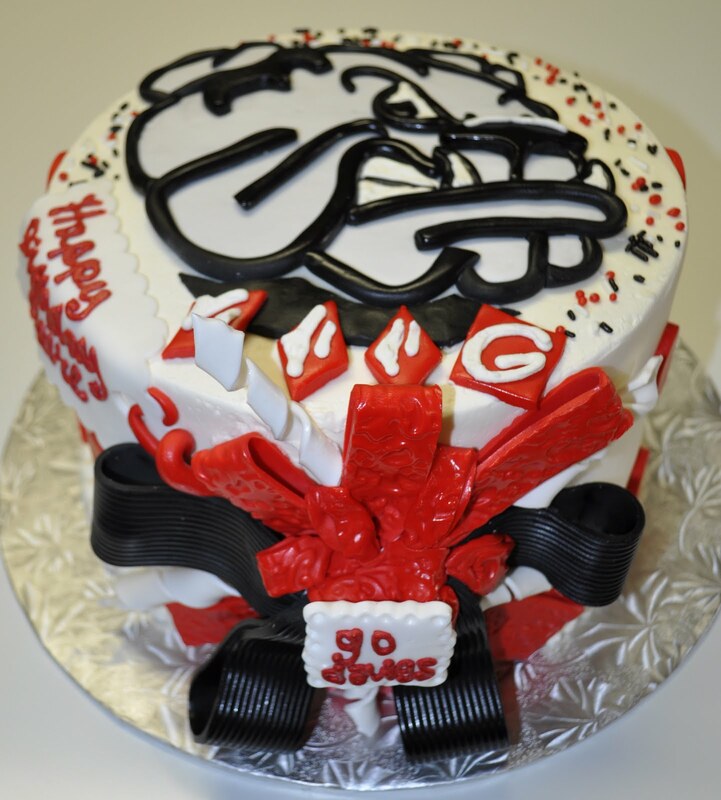 "UGA" the bulldog is made out of light grey and black fondant. The big bow in front is also made from textured fondant! Go Dawgs!